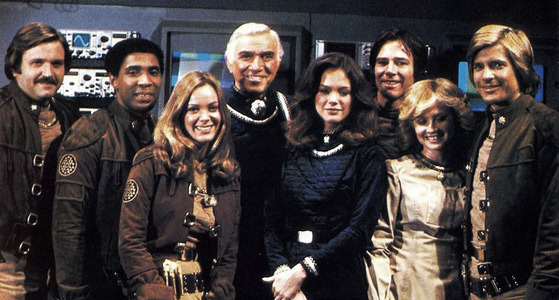 One thing that I really enjoyed growing up was Battlestar Galactica. Now depending upon when you were born, this may mean many different things to you. If you were born in the last 15-20 years, you are probably thinking about New Battlestar and Caprica which were staples on SYFY network in the early 2000's. But if you are old like me, Battlestar Galactica usually means classic Battlestar Galactica. The short lived sci-fi television show with Richard Hatch, Dirk Benedict, and Lorne Greene. This Battlestar was the show of my youth. I tried New Battlestar and much like New Coke, it wasn't for me. 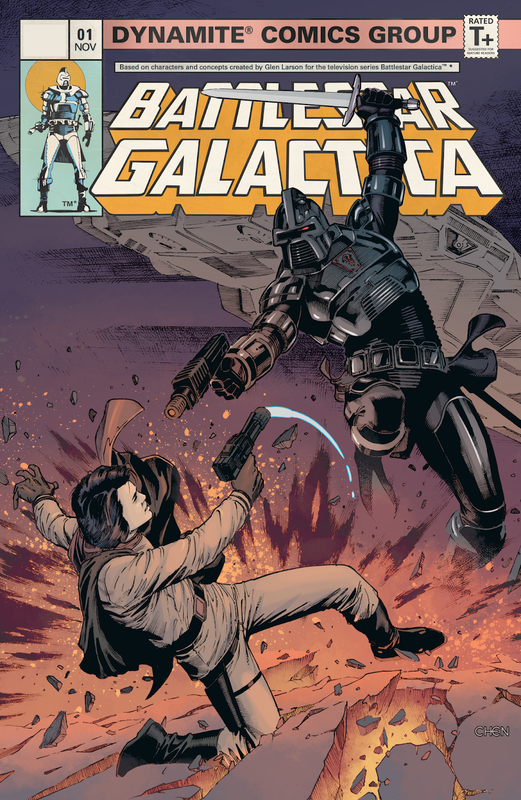 So I was intrigued when I saw that a new Battlestar Galactica comic book was coming out. When I initially heard about it, I assumed that it would be New Battlestar as the classic show has a waning, older audience. Plus, since the passing of Richard Hatch- who really kept alive the idea and importance of Classic Battlestar Galactica, I had not seen much written about that version of the characters. To my surprise, this comic book focuses on the classic characters and designs and even the cover has that super 70's vibe to it. This story focuses on, what is often lost, when talking about Battlestar Galactica, the original mission of the lost 13 colonies looking for Earth. As Adama is commanding his crew they are looking for passage through an alien system and their people the Kiernu. The aliens refuse passage but Adama takes them through anyway to save fuel and escape the pursuing Cylons. When the Cylons get wind of this, the send in Lucifer and the Centurions to punish the Kiernu and they kill many of the inhabitants of their planet; even though they refused passage of the Galactica through their star system. Back on the Galactica, a group of Viper pilots who were out on patrol, led by Apollo, come back with 100 ships from an alien race they had encountered. 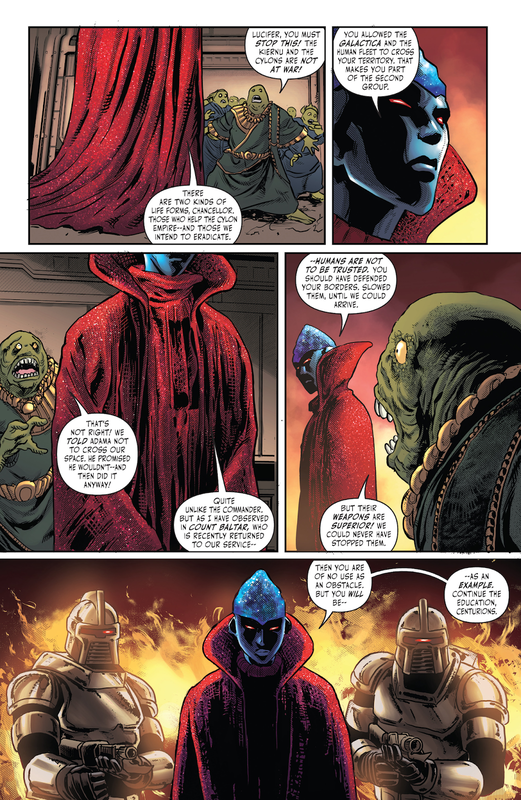 The people are called the Okatit and they are also on the run from a group of slaves who look to steal their technology and enslave their people. 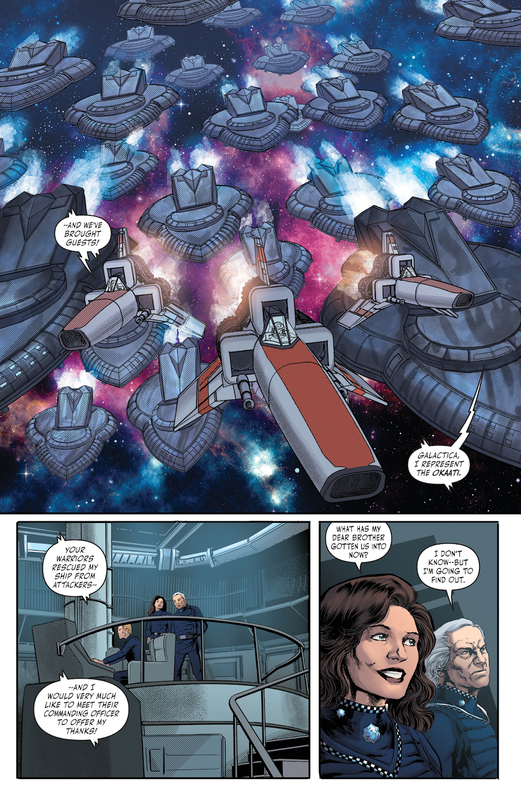 They ask for safe haven with the ships of the Galactica; something Adama is unwilling to do based on his suspicions of their motives and if adding them will help the Cylons catch up to them. 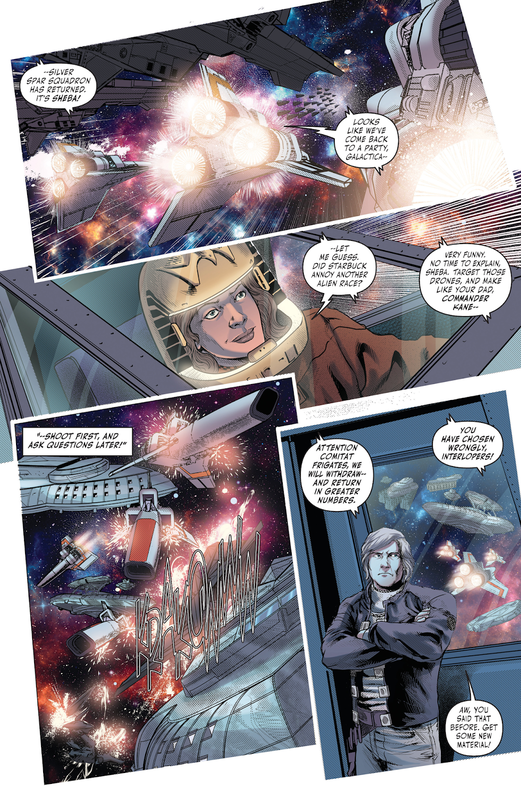 Of course there are your space battle scenes, which play out so well in the medium of comics. Vipers scorch across space against alien spaceships and its really an awesome display by artist, Daniel Hdr. The book ends with Adama finding out the fate of the K... people and him dealing with the guilt of being commander of the Galactica and his decision leading to their destruction by the Cylons. Overall this is a great book for fans of classic Battlestar. For Black Battlestar fans, Colonel Tigh does make an appearance, but not Boomer. I am sure he will show up at some point. This would be a great jumping on point for someone who grew up on new Battlestar and Caprica to get a sense of the flavor of the classic lineup. Who knows we may finally get that Battlestar Galactica movie that Richard Hatch so hoped for! !